Dude's top products of January 2019 recap the bright spots of a dark month. This mini-escape from winter is communicated in pictures, in words, and in links to buy more crap, or learn more about crap you can't afford to buy. Enjoy! Note: Product prices are listed as they were at printing. Prices are subject to change. I am Batman! ... In my dreams. Which makes this Batman Sleep Mask an especially welcome addition to bedtime in the house of Dude. 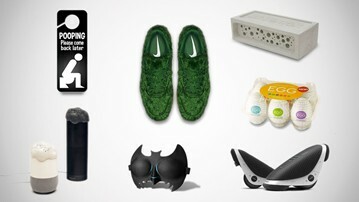 The Dark Knight logo is cut out as a 3D memory foam eye mask too, so its eye cavities will impose no pressure on yours as a you sleep, and the soft, odor-free material will always bounce back to its original shape, even after a night of tossing and turning through a battle with Bane. The Pooping Please Come Back Later doorknob sign is an obvious must-have choice for the bathroom door, but seller Graphics and More just made me an even bigger fan of the twist on Do Nut Disturb hangers by showing one dangling from a house's front door. Ha! Genius! I wonder if a frank communication that I'm currently taking a crap would dissuade solicitors. Call them the building blocks of bee conservation. Bee Bricks, a clever contribution to the endangered solitary bee population, are filled cavities that provide a safe place for individual bees to lay their eggs. They come in 3 different shapes and sizes, designed either as a freestanding bee nest for the garden, or for integration into a brick wall or building. You know what they say: if you can't beat the egg, let the egg beat you. At least that's what I'd guess they say around the Tenga Easy Beat Egg production line. From the same Tenga that brought you the Flip Hole male masturbator comes (hard, I hope!) another men's pleasure device - this one with a name just as chuckle-worthy, a size that makes it even easier to carry, and an effect Tenga says will send you straight into a state of...eggstasy. I never thought I'd get so hyped about the possibility of building my own parasite. But when the thinking-putty-looking glommer is a Project Alias parasitic fungus, a parasitic fungus built to cap off your Amazon Echo Alexa or Google Home, and make sure they're not listening to you when you want some privacy, now that's a DIY parasite I could get behind making. And, if it works, spreading to the masses. Project Alias is a smart speaker parasite that counteracts the Echo's and Home's methods of sucking information out of you. From its perch on top, the 3D-printed mass uses Raspberry Pi technology and its own set of speakers to block the smart speakers' microphones with continuous white noise, thus disabling them from listening to you 24/7. I don't know if Nike's Air Max 1 Golf "Grass" Sneakers are a response to growing pressure from golf lobbyists or what, but it does seem they had some motivation, maybe internally, maybe externally, to get the sport more mainstream attention. Or attention from a younger audience. At least for this month, the Nike Air Max 1 Golf "Grass" sure does make golf stand out a little more in the shoe world. It appears earlier today, January 31, 2019, Nike officially released the Air Max 1 Golf "Grass" edition, and to an immediate sell-out. You can still get some...for around 2 to 3 times retail value...at Stockx. The Reapr Survival Spear is suitable for both hunting and tactical applications, or, Reapr adds (to whom I'm betting is their primary buyer demographic) "just plain looking like a rebel." I'll bet before you saw Segway's Drift W1 eRoller Skates you thought riding a Segway couldn't get any more fun. And that the likelihood of sustaining an injury while doing it any higher. That's what I thought too, but we were wrong. Segway made a pair of electric roller skates. A take on hoverboards, able to roll along at up to 7.5MPH, but running independently, one on each foot. Need a fire pit that meshes a little better with your on-the-go lifestyle? The Portable Outdoor Fire Pit from Rootless is a setup of folding legs and a rollable stainless steel mesh net, both of which pack into a slim carry sack for schlepping along on camping trips, picnics, beach days, buddies' back yards, or anywhere you want to enjoy a simple, elevated campfire experience. The Great Grey Shark Chair, now that's what I'd call a fantastic beast. As for where to find them, well, it's going to be much easier than tracking down a niffler or a bowtruckle. Just head over to the Reroom UK shop on Etsy, and find the Great Grey Shark there ready to take a bite out of your kid's room...or GAM's* room...decor. Warning: The Great Grey Shark Chair will also take a good-sized bite out of your wallet. Logosol's Smart Splitter shares the same log- and kindling-splitting goals of the Kindling Cracker and Vipukirves Leveraxe: speed and safety. But from a design and usage standpoint, it's different than both. The Swedish patented Smart Splitter is a 2-poled tool with a pair of wedge axes and a striking weight on its workaholic CEO side, and a stabilizing leg on its supportive significant other that holds the family together side. In tandem, Logosol says the two make breaking down trees into logs and kindling simple and safe for anyone, and much easier on your back, arms, and shoulders. Portland, Oregon-based Alpine Division calls itself a company that is "inspired by nature but rooted in the city." Backpacks, duffels, cases, and hats able to rough it on the weekends but keep it classy in the office (and at cocktail hour) fill the Alpine Division online store. New for Fall/Winter 2018/19 is the company's Navy Collection, which includes a stacked set of packs, all made of 1000D water-resistant ripstop nylon outers and Alpine Division's signature 420D ducky liners, and all hued in a rugged, dapper-duck blue.